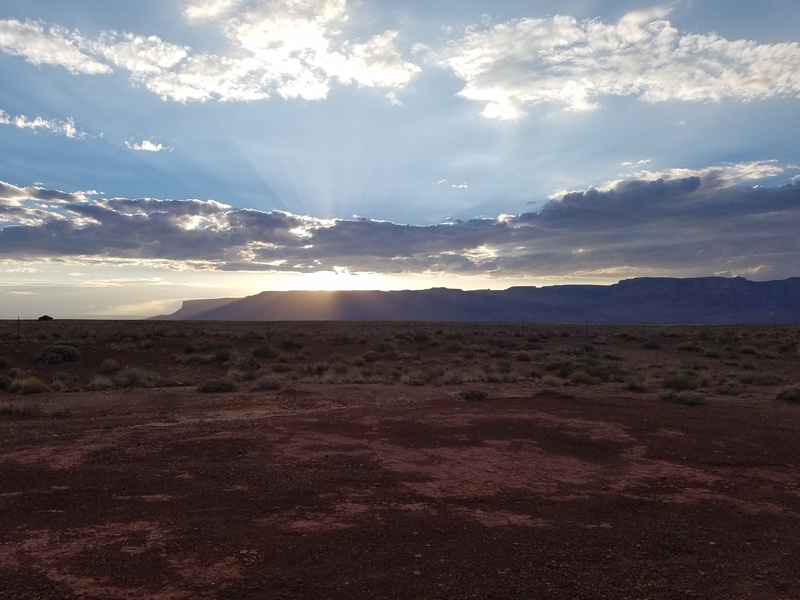 The Grand Canyon was this week’s big adventure, but before we get there, I did go on a smaller adventure earlier in the week. It was one of the travelling doctor’s last week at the clinic this week, and she wanted to go a hike before she left. A group from the clinic went together and we hiked to the belly button. I was not a big fan of the hike (most of it was right along the edge). I did manage to get most of the way) to the top with some encouragement from some coworkers, and the view was beautiful. The hike was definitely difficult for me, but I am really glad I decided to do it. It was really neat from the top because the view overlooked the hospital and was a different perspective than you get driving in or from right next to the hospital. On Saturday, my adventures at the Grand Canyon began. I spent all of Saturday on the South Rim. I drove to the park from Flagstaff on Saturday morning. I left the hotel before 8am to try and have as much time in the park as I could. I got to the parking wasn’t too bad. Once in the park though, I didn’t try to drive anywhere; I used the free shuttle or walked between stops. I took the shuttle all the way to the West most stop on the South Rim, Hermit’s Rest. It took about 2 hours from the time I left flagstaff to arriving at Hermit’s rest. From Hermit’s Rest I walked and caught the shuttle between different overlooks on the way back towards Grand Canyon Village. I probably should have gotten off at some of the overlooks on the way out to Hermit’s Rest, because the bus does not stop at all of the overlooks on the way back to the village from Hermit’s rest. The rim trail from the village to Hermit’s rest is 7.9 miles long. I walked close to 4 miles of the trail, but still missed 3 of the overlooks. It was a pretty cool and cloudy day, and it did rain for a while. I ate lunch, and got out of the rain in the Yavapai Lodge. The food was surprisingly not outrageous in price. I had looked at the menu at the restaurant in the Bright Angel Lodge as well before deciding where I was going to eat, and prices there were definitely more expensive, and selection was not as good. The Yavapai Lodge definitely had a variety of choices and was a nice casual option for lunch. I had packed a cooler, but I left the cooler in my car thinking that I would be able to stop back by at a reasonable time. It definitely took way longer to get from one place to another inside the park, so putting an insulated lunch bag in my backpack probably would have been a better idea. In the afternoon, I decided to go for a hike below the rim. I chose to go for the South Kaibab trail instead of the Bright Angel trail because the reviews all said that the view opened up more on the South Kaibab even though the trail itself was maybe a little more difficult. I hiked to Ooh Aah point which is about 1 mile down (and then back up again), and the view was spectacular. The trail was definitely steep, and the gravel was a little loose and slippery from the rain at parts. It was a little bit difficult, and definitely required me to pay attention to exactly what I was doing the whole time. There is no water or shade on the trail, but it was a little overcast and it wasn’t too bad having to take water just for Ooh Aah point. The trail is also a mule trail, but I didn’t cross paths with any on my afternoon hike. After the hike, I stopped by the Visitor’s Center, which was much more crowded and had far longer waits for information than any other park I have been to. The visitor’s center doesn’t have a ton of exhibits or displays. I did not make it to the Geology museum, but I would guess that more of the exhibits and displays that are often at the visitor’s centers, would have been there. I also stopped at Mather Point overlook. Mather Point was the busiest overlook that I went to, and it was definitely hard to get pictures or get a good spot along the railing because there were so many people. Up until Mather Point, I was always aware that there were tons of other people on the South Rim, but it wasn’t too difficult to find a spot without people. On Saturday evening, I spent sunset at Yaki Point. I did go a little bit off from the official overlook, and found my spot about an hour before sunset. A family joined me about 45 minutes before sunset and were very nice and we both let each other have turns taking pictures. Another couple came to our spot about 15 minutes before sunset, and they were not nearly as respectful. The sat right in front of us without even saying a word to us just because we had not sat all the way up on the edge. The sunset was gorgeous, and the moonrise was neat to see as well. The moon was close to full, so it was really bright and beautiful. It was really cool to see the shadows as they moved across the canyon. At first it was hard to see a lot of the formations that were further away in the canyon because of the glare, but as the sun go lower the shadows overtook the whole canyon and the formations became visible again. I had been a little nervous that the sunset wasn’t really going to be visible because of how rainy and cloudy it had been all day, but the clouds mostly cleared a few hours before sunset, and it ended up being amazing. On Sunday, I went to the North Rim. The drive to the North Rim was really beautiful, and it was so different than the South Rim. It took about 4 hours to get from Flagstaff to the North Rim, and a lot of it was winding roads. There were several neat rock formations along the way to the North Rim, as well as several badland looking areas that reminded me a little of Petrified Forest. It was really neat to see how a lot of the geology and features of the land continued from one area to another outside of the national parks. The drive to the North Rim also goes through the Kaibab National Forest, and it was really cool to see all the trees for miles and miles. There were also several sections that had been affected by wildfires, and it was breathtaking to see how much destruction and regrowth there had been in those areas. It was really neat to see how nature heals and repairs itself and keeps going regardless. When I got to the park, the entrance gate was definitely less crowded. The road inside the park after the entrance station to the Visitor’s Center was way longer than I had anticipated. The North Rim has a super nice camping area with log cabins and rocking chairs, and I definitely think that it would be way better for camping than the South. There were also several trails in the forest and around the area, but there is not a rim trail like there is on the South side. There is a full service gas station inside the park on the North Rim, which I was very grateful for because there are not a ton of places to stop on the way in, and driving is pretty much required to see anything on the North Rim. There are a few overlooks near the lodge on the North Rim, but the really unique and cool parts of the North Rim require a bit of a drive. The road to the overlooks on the North Rim is about 26 miles from the Visitor’s Center. The road forks about 10 miles in and there are 2 main overlooks, with several smaller stops along the way to each. The first overlook is Cape Royal. Cape Royal is on top of one of the arches in the park. The road to get there is winding and I was not a huge fan, but the overlooks are definitely worth it. There are a few stops where you can really see the arch as you are going up, and then the view from the top is actually on top of the arch. It was also really neat because the trees continue almost all the way to the overlooks, so you really get to take it in all at once when you clear the edge of the trees. The second main overlook is Point Imperial. Point Imperial is the highest elevation point in the park, and the views and nothing like the views on the South Rim. It almost feels like the canyon stretches out longer from Imperial point. It was definitely a really neat stop, and it again felt like the forest just opened up at the edge of the canyon. The North Rim definitely had fewer visitors total than the South Rim, but I actually had more difficulty taking pictures and getting away from crowds on the North Rim. 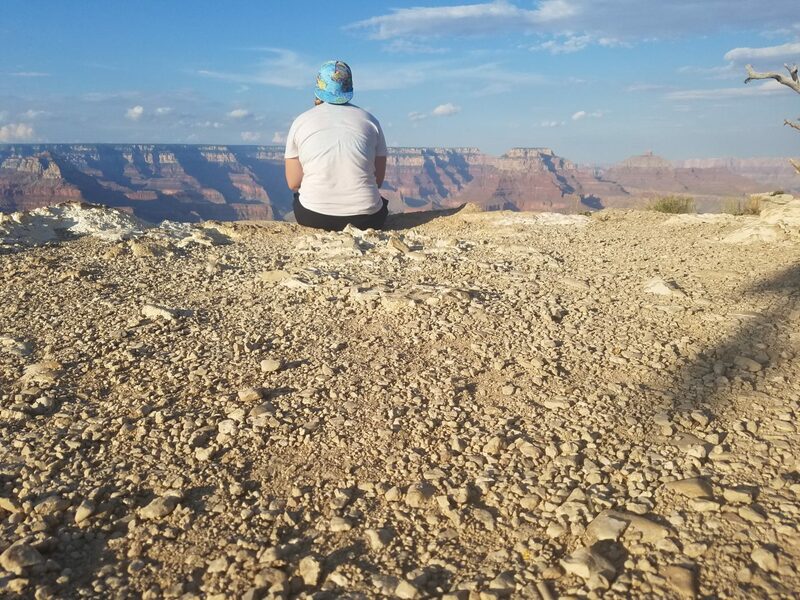 There are way fewer points where you can see the canyon, so everyone ends up at the same spots on the North Rim, whereas the South Rim has a really long rim trail that lets people spread out more. The North Rim overlooks are also much rougher and natural ground than the South Rim. There are still safety fences on the North Rim, but much more of the rock has been left natural, whereas the South Rim does have several paved overlooks and more accessible overlooks. The North Rim definitely had more to offer as far as camping and wildlife and the forest. The North Rim also allowed for a little more independence in getting from place to place in your own vehicle. Both rims had spectacular views that were unique and breathtaking. Overall, I would say the South Rim had more to do, was more accessible, and was easier to avoid crowds once in the park. If you get there early in the day to get through the entrance and get parking, the South Rim is definitely my recommendation. On the way back from the North Rim, I made a few stops. The first was in a place called cliff dwellers. It was right along the highway, and it had all of these little ruins and rock formations that were really cool. It was a quick little stop, but was definitely interesting to see just along the side of the highway. I also stopped at the Colorado River. The bridge was really cool, and it was neat to get to see the river. It was strange to see how far down the river was, and how much of a canyon it had made. Next to the bridge there is also some interesting historic information on the Lees ferry crash and the building of the bridge. My last few stops were to take some pictures of the sky. The sun looked really cool behind the clouds just before sunset, and a little later on the moon was spectacular. Sunsets out here have not been nearly as great as I was hoping, but the moon and the night sky have absolutely blown me away. I find myself looking up at the night sky and how beautiful it is regularly. The moon was very close to full this week, and it was just magnificent. This week’s adventures were a ton of fun, and it’s hard to believe I only have 1 month left here. I still have so many things I want to see and do before I leave.